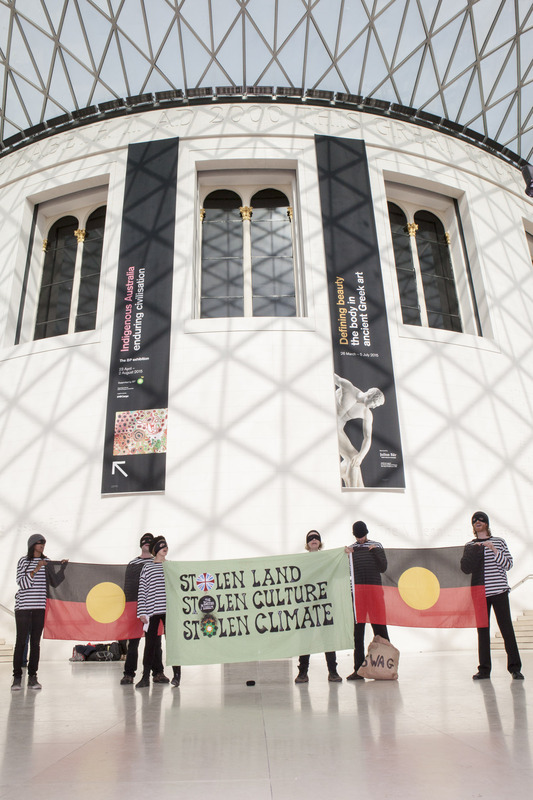 Stolen Land, Stolen Culture, Stolen Climate – BP or not BP? Posted on April 24, 2015 by BP or not BP? This week, the new BP-sponsored exhibition ‘Indigenous Australia: Enduring Cultures’ opened at the British Museum. On Tuesday, we gatecrashed the exhibition’s press launch with a banner reading “Stolen Land, Stolen Culture, Stolen Climate”. Our protest gained coverage on BBC Radio 4’s flagship arts programme “Front Row”, which you can listen to here, and also in The Australian, here. This blog post gives some background as to why we were there, and why so many people have serious concerns about this exhibition, relating both to aboriginal rights and BP sponsorship. This is a short briefing on just some of the issues. It gives a general introduction but includes a number of links to articles by, and interviews with, aboriginal activists. By asserting the doctrine of ‘terra nullius’ (that the land is uninhabited), the British had no obligation to respect the rights of Indigenous peoples because they were not recognised as being human. (The Aboriginal people were classed as flora and fauna.) The doctrine originates from a “Papal Bull” implemented by Pope Urban II in 1095. This, and a number of subsequent doctrines from the papacy, bestowed upon Christian nations the right to invade, settle and convert non- Christian nations. The Aboriginal movement for land rights came to prominence in the 1960s, largely in response to mining companies being allowed to access Aboriginal land. In 1983, Aboriginal peoples were initially promised legislation that would secure land rights that would have included control over mining rights on Aboriginal land and access to mining royalties. However, Australia’s state governments would be able to still introduce their own legislation and could choose how to implement land rights legislation or whether they should introduce it at all. Following concerted pressure from the mining industry, the Prime Minister at the time, Bob Hawke, withdrew his commitment to giving Aboriginal peoples a veto over mining activities taking place on their land. His government gradually backtracked from introducing national land rights legislation, claiming that most states had made “advances” towards land rights. You can find out more about the Aboriginal National Unity Government here. Gary Foley has written about a range of issues relating to Aboriginal land rights which you can access here. The new British Museum exhibition features a placard from the Aboriginal Tent Embassy, a structure of placards, flags and beach umbrellas erected outside Parliament House in Canberra in 1972. It was created by four community representatives who travelled to the city to ask for title deeds to their land from the Prime Minister. It followed a Northern Territory Supreme Court Decision in 1972 that granted a mining company access to Aboriginal land and concluded that Australian common law did not recognise Aboriginal land rights. The Tent Embassy became a focal point for protest, with the parliament eventually introducing legislation to have the camp removed. The police were noted for being particularly violent in their attempts to remove around 2000 protesters from the site. • Native title legislation is about recognising Aboriginal peoples’ connection and rights to land and water. • Land rights legislation in New South Wales is about compensating Aboriginal people for past dispossession, dislocation and removal of land. In 1967, a referendum gave the national government the power to make laws for Aboriginal people and to fund homeland communities. (The national government is also known as the Commonwealth Government, as Australia’s full title is “The Commonwealth of Australia”). In 2014, the government attempted to pass the responsibility for funding homelands from the commonwealth to the state governments. In Western Australia, where this has happened, the state premier, Colin Barnett, has moved to close 150 of the state’s 274 homelands, referred to by some as “remote communities”. This will involve the removal of state support and provision for communities, such as schooling, water supply, education etc. On 10th April, over four thousand protesters took part in a rally in Melbourne against forced closures, shutting down a major street in the city and blocking tramways. It is just one protest as part of a growing movement known as ‘SOS Blak Australia’, which aims ‘to support the Aboriginal communities in Australia to remain in their homelands and on country and enable them to self-determine their own futures.’ A call has been issued for a global day of action on the 1st May. You can listen to RT’s full interview with Ghillar Michael Anderson here and view their article here. People in the UK can join the UK Aboriginal Solidarity Network and follow #SOSBlakAustralia to find out about events happening in the UK. In 2004, Gary Foley and Gary Murray, a representative of the Dja Dja Wurrung people, were involved in trying to secure the return of the barks. While working for the Museum of Melbourne, Foley secured their loan from the British Museum. Once in the country, an emergency declaration was secured over the barks. (The law in the state of Victoria recognises the importance of protecting stolen Aboriginal items.) The British Museum, fearful of setting a precedent that could bring about the return of the Elgin Marbles, put pressure on the Melbourne Museum by informing them they were in breach of contract by not returning the items and insisted they take legal action against the Dja Dja Wurrung people to have the declaration lifted. (Foley subsequently resigned from his position at the museum.) Despite growing international support, the Melbourne Museum used its influence to eventually secure them a win in court and the return of the items to the British Museum. New legislation was subsequently introduced to prevent the situation arising again. The British Museum holds more than 6,000 Indigenous Australian items in its collection, of which only a minute percentage is usually on display. It is estimated that there are over 1,000 Aboriginal remains in museums around the world and Aboriginal experts estimate there could be ten times that amount. Britain is known to hold 643 sets of Aboriginal remains. In 2006, the British Museum trustees returned some Aboriginal remains to Tasmania. 1. Indigenous peoples have the right to manifest, practice, develop and teach their spiritual and religious traditions, customs and ceremonies; the right to maintain, protect, and have access in privacy to their religious and cultural sites; the right to the use and control of their ceremonial objects; and the right to the repatriation of their human remains. 2. States shall seek to enable the access and/or repatriation of ceremonial objects and human remains in their possession through fair, transparent and effective mechanisms developed in conjunction with indigenous peoples concerned. BP uses sponsorship of arts and culture as a way of gaining what it calls its “social license to operate” – the public perception that it is a credible and socially responsible company. By associating its brand with museums and galleries, BP hopes to draw a veil over its injustices around the world, such as the Deepwater Horizon spill in the Gulf of Mexico. In 2000-11, BP contributed just 0.8% of the British Museum’s income but splashed its logo over major exhibitions. BP also has a track record of disregarding indigenous rights in a number of countries and is therefore a particularly inappropriate choice of sponsor for this exhibition. ‘As BP fight in the US courts over their disastrous Gulf of Mexico oil spill – the worst in history, devastating marine life, fisheries, tourism and local communities, they are pushing to drill off the South Australian coast within a year. Not only is BP pushing to drill off our coast, but they are targeting the Great Australian Bight, a whale nursery and sanctuary recognised internationally for southern right whales and their calves, blue and humpback whales and Australian sea lions. To get approval for exploration drilling, which is when it all went wrong in the Gulf of Mexico, BP must submit an Environment Plan to the National Offshore Petroleum Safety and Environmental Management Authority (NOPSEMA). They are required to carry out appropriate consultation. BP is consulting with a very general powerpoint presentation that makes assumptions for an oil spill based on an arbitrary 35 day “worst case”. Their Gulf of Mexico spill poured oil into the sea for 87 days. All the resources of the USA could not stop oil from contaminating the shorelines of four US States. The Great Australian Bight is extremely remote, with significantly rougher seas and more extreme weather conditions than the Gulf of Mexico. BP is refusing to disclose key oil spill modelling – including socio-economic and fisheries impact modelling, and are yet to complete oil spill emergency planning. The obvious question is what exactly are we being consulted on, given that critical information required for the people of South Australia to come to an informed position is being withheld. The Great Australian Bight Research Program, partly funded by BP, is due to be completed in 2017. The Literature Review for the Ecosystem Study states, “Our current knowledge of the Great Australian Bight is not sufficiently developed to confidently assess the implications of potential oil and gas production, including potential oil spills, for the region’s diverse marine ecosystems or for its economically important existing marine industries”. With BP pushing for approval to start drilling in early 2016, alarm bells should be ringing. Research just published in the scientific journal Nature indicates that to have any real chance of minimising the impacts of climate change, about half of the known oil reserves in Australia’s “OECD Pacific” region need to stay in the ground. Given this fact, why are we entertaining the idea of risky deep sea drilling in the hope of finding even more oil? Imagine if we could move beyond petroleum and capitalise on the abundant renewable energy resources in Australia. 2014 has been announced as the world’s hottest year on record, and 7 out of Australia’s 10 warmest years have occurred since 2002. We create an oil spill inside the British Museum, with Reverend Billy and the Stop Shopping Choir!